Hello dear friends and welcome to my Easter Tea! I have some pretty china and dessert for you to enjoy today. Today's dessert is a recipe my aunt gave me years ago but I have made a couple of changes to it. At one time she did a lot of entertaining, as did I, and this dessert was always a big hit. Hers called for a layer which I replaced with a different layer of yumminess. Hers also had cherry pie filling on top which I changed. Do you like a banana split? When I was a young girl, they made banana splits differently than they do today. I remember they gave you scoops of hard serve vanilla, chocolate, and strawberry ice cream snuggled in between a split banana and a different topping poured over each scoop. There was pineapple or caramel on the vanilla ice cream, chocolate syrup on the chocolate, and strawberries on the strawberry ice cream. They finished it off with whipped cream, and a bright red stemmed cherry. And nuts if you wanted them. What a treat it was and a little girl's eyes would grow as big as saucers looking at the confection! 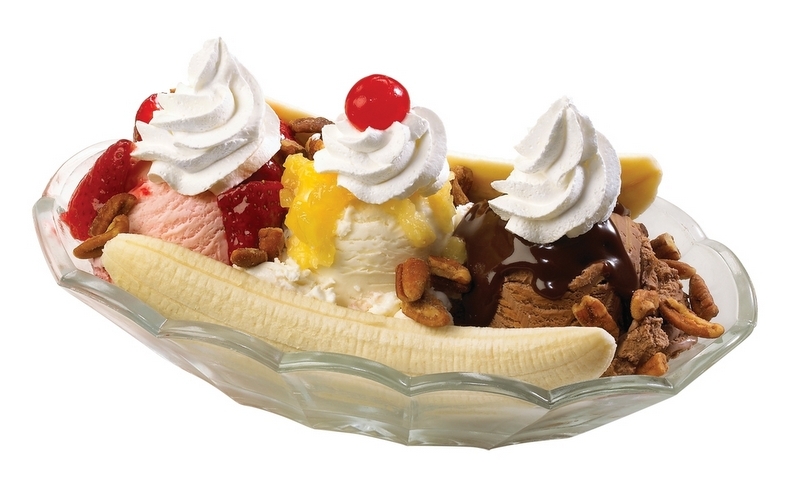 They don't make banana splits like that any more, at least not around here. Well this Banana Split dessert is a little different twist on the ice cream confection and it is made with a lovely cream cheese layer, bananas, pineapple, strawberries, and finished off with whipped cream, cherries, and a drizzle of chocolate syrup. Yum! I hate to break it to you but this is going to wreck any diet you may be on. But, it's Easter and one should have a pretty delectable dessert to enjoy for the holiday. Easter after all, only comes once a year, doesn't it? I will share the recipe later this week. Since Spring has sprung and Easter is just a few days away, I have set my table accordingly with pretty china and a bunny. I like a little whimsy this time of year, don't you? Earth is beginning to come alive after its long winter slumber and what a better time to share some whimsy? My bunny, basket, and sparkly egg were a giveaway win several years ago from blogger friend, Celeste, who is a beautiful artist, and now is the perfect time to share them. I love her delicate roses! I love chocolate but sometimes I want just a little something so I have these Hershey's Eggies to satisfy the craving. I have loaded up my pink and green depression glass cup. My tea is Lady Grey and I am using a lovely green Colclough teacup and one of my Lavender Rose teacups. The Royal Albert Lavender Rose once belonged to my mother and when she downsized she gave it to me. I love its delicate pattern of deep pink roses with sprigs of lavender leaves. Alas, when I was taking the cups down, one cup slid off the saucer and the handle broke off. I was distressed at first but decided I will use it in a teacup wreath some day. I'm glad I have several cups in this pattern. I actually had a couple of accidents while preparing this post. The pretty table cloth you see is one of my treasures. It was a very thoughtful gift from Bernideen last year when I was going through all my health issues. I love every old-fashioned inch of it and every time I look at it, I think of my good friend. So, would you like to join me for some tea and banana split dessert? I do enjoy your company. As much as we enjoy having the holiday, Easter is so much more than bunnies, chicks, and eggs. The most important reason for celebrating Easter is the incredible gift of life which was given to us by our heavenly Father through His Son, our Lord Jesus. I pray your Easter will be a blessed time to reflect upon the true meaning of this Holiday. Thank you for joining me for tea today and Happy Easter to you all! What a beautiful post, Sandi! Your dessert looks delightful, your tea things are always beautiful, and your sweet spirit is shining through your words! So thankful for Jesus' sacrifice on our behalf. Incredible love. Oh Sandi, what a beautiful Easter tea you've shared with us, with such a delectable looking dessert! When I saw your bunny, I thought that it looked like something Celeste would paint, and I was right! The gifts are beautiful, and look so pretty with your teacups, teapot, and your gorgeous tablecloth from Bernideen. Thank you for the quotes that you've selected, and may you have a wonderful Easter week! I love all things banana so I'm salivating over your yummy banana split dessert! I'm sorry to hear about the teacup casualty. I've accidentally snapped off the handles and repurposed broken teacups as storage containers. I'm admiring Celeste's artistry on the bunny, basket and egg. So pretty! Happy Easter, Sandi! What a lovely post, in photos, deliciousness, and the sweet truth about why we celebrate Easter. He is Risen! Beautiful post! I imagine Easter was a lovely time at your place! Gorgeous photos! This wonderful post is my favorite,everything is perfect...So sweet and dainty...Adorable china!! !Love the cute bunny and beautiful tulips.Happy Easter! Happy Easter to you and your family, Sandi. "You ask me how I know He lives, He lives within my heart!" Yes this is such a meaningful week. What our Lord did for us is - well, unbelievable and yet we do believe He did. Our hearts are full of love and gratitude for our salvation brought about by Him. Thanks for sharing your lovely table and that beautiful china. Happy Easter to you! This is beautiful and you can never go wrong with Royal Albert. Your table looks lovely all ready for easter. Have a blessed one. The tulips are a beautiful color Sandi! Thanks for your comments and participation in Home Sweet Home! Have a blessed and lovely weekend! Sandi, we still make a banana split now and then. Very rarely, but what a treat when we do! I have had banana split dessert, but it was years ago, looks delicious! I recognized Celestina's roses. Thanks for sharing with SYC.